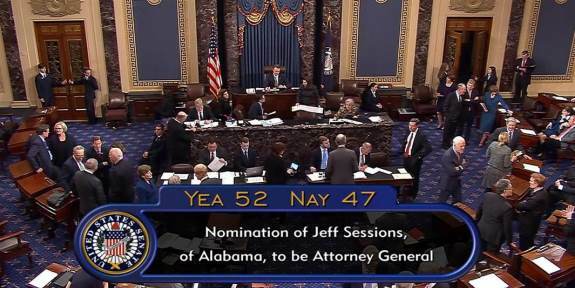 Conservatives celebrate today as Jeff Sessions was finally confirmed by the Senate (to lead the Department of Justice) last night in a mostly party-line vote, 52-47, ending almost a month of contentious “debate” over the Alabamian’s past history and fitness for office. Sessions’ ascension to the position of the nation’s top law enforcement officer couldn’t come soon enough for many as America has suffered under eight years of ideologically-driven partisan favoritism under Obama’s two attorneys general. Anyone who’s been paying attention knows both Eric Holder and Loretta Lynch were two of the most compromised, corrupted self-interested hacks in Washington. To them, the Justice Department was merely an officially sanctioned launching pad for helping political friends and persecuting Obama’s enemies. No doubt one of Sessions’ first duties will be to find ways to clean up the immigration mess that’s plaguing the country, including the recent dust-up over President Donald Trump’s travel and immigration restrictions. As the days go by it’s become clear that the left’s motivation for defying Trump was about more than simply protecting the rights of foreigners to journey here. Byron York of the Washington Examiner writes, “Why is Washington State mounting such a vigorous challenge to President Trump's executive order temporarily suspending non-American entry from seven terrorism-plagued countries? Of course there are several lawsuits against the president, and there are lots of motives among the various litigants. But Washington State's is the suit that stopped the order, at least temporarily. And a look at the state's case suggests that, behind high-minded rhetoric about religious liberty and constitutional protections, there is a lot of money at stake. The very idea that a state would claim financial hardship as a reason for overturning a lawful executive order on a national security concern is insulting. But it’s just the times we’re living in and the forces of the left we’re battling against. Not only is Trump’s immigration policy perfectly permissible under the president’s broad constitutional powers to protect the nation, it’s also generally popular with the public. The jury is still out on what will ultimately happen with the travel and immigration restrictions, but one thing’s for sure, there are a lot of happy law enforcement personnel in America today who are ecstatic now that Sessions will be helping them do their jobs. Susan Crabtree of the Washington Examiner reports, “Sessions' efforts to crackdown on illegal immigrants over the last decade often put him at odds with many of his Senate colleagues who voted in favor of giving illegal migrants already living in the country a path to citizenship. But the stance is already winning him kudos from law enforcement groups, eager for a helping hand from Washington. Several of the California sheriffs indicated Obama’s attorneys general were completely non-responsive to their requests for assistance in dealing with criminal illegal aliens in their jurisdiction. Translation: the Obama administration was intentionally ignoring the law in order to pursue its own political agenda. With Attorney General Jeff Sessions now in charge of the Justice Department, America is going to get just what it needs: no nonsense law enforcement. While the Democrats and media continue to obsess over Donald Trump’s cabinet nominees, executive orders and appointment of Judge Neil Gorsuch to the Supreme Court, they’re also beginning to freak out about the president’s telephone etiquette. Similar to the way they’ve complained about the new president’s fondness for tersely expressing himself via Twitter, liberals don’t believe Trump is speaking gently enough to world leaders in phone conversations, either. Really? Our enemies are being “emboldened” because of Trump’s phone demeanor? As if the griping about “tone” wasn’t bad enough, Democrats such as Virginia Senator Mark Warner are up in arms about the reported content of the phone calls too. Warner commented “This is not the way you lead our country.” Meanwhile, career State Department employees are apparently alarmed at Trump’s attitude with foreign leaders. It looks like the politically correct speech monitors are now overseeing even Trump’s use of language. But in reality it sounds like the State people are only mad because Trump didn’t ask them for briefings before dialing. Boo hoo. We had to figure the foreign policy establishment would fight Trump tooth and nail once he was in office, but did we know it would be this bad? Finally, it appears as though someone gets it! I can’t speak for the Trump administration, but if the question is whether the average American trusts the bureaucratic “experts” to handle matters of foreign policy, the answer is a resounding “no.” These are the very same “experts” who have bungled situation after situation, ignored danger signs, misinterpreted facts and frankly, have gotten people killed. The foreign policy establishment is chock full of globalist liberals and neoconservatives who either believe the United States is an evil hegemonic power that forces itself upon the un-consenting bodies of foreign countries or, as is the case for the neocons, that America should meddle in every country’s affairs and try to control everything with the might of the armed forces to back them up. Donald Trump represents a refreshing departure from both extremes, promising an America First foreign policy while also granting other countries leeway to advance their own interests. Trump also believes that NATO should shift its focus to combating the real security threat of the 21st century – radical Islamic terror – and that member nations should pay their share for the alliance’s protection guarantees. I don’t consider any of Trump’s policies “radical.” Unconventional? yes; different than his predecessors -- absolutely. It doesn’t matter at all how Trump speaks with foreign leaders or favors the ones where he’s able to establish a personal relationship. What president in modern history didn’t forge some sort of a bond with certain foreign heads of government? Did FDR not have a connection with Churchill? Did Reagan and Margaret Thatcher not forge a personal friendship that helped further relations between the U.S. and Britain? Did Bill Clinton not become phone chums with Tony Blair? The examples extend well beyond America and the Mother Country. Presidents have always played favorites and just because they develop a rapport doesn’t mean the United States is going to be tossed under a bridge because of it. Did the foreign policy establishment similarly worry about Obama when he first came into office despite having virtually no worldly experience? How come we didn’t hear stories from the media about Obama’s phone conversations and tone? This whole affair is just another example of the media singling out Trump for some particular aspect of his personality or policies they don’t like. And the fact that the career “experts” at Foggy Bottom are put off by the president is probably a good thing, since change is badly needed in the federal bureaucracy in every department. If there’s some discomfort there, then maybe they’ll stick to doing their jobs instead of seeking out nosy Politico reporters who are just looking for damaging anti-Trump gossip. Speaking of nosy – and Politico – apparently foreign countries are having misgivings about inviting President Trump for a state visit. Nahal Toosi of Politico reports, “Less than a month into his presidency, Donald Trump is forcing foreign leaders to grapple with an extraordinary question: Is it worth the political risk to invite him for a visit?.. Are these foreign countries really that concerned about protests? There were similar worries expressed during the two Bush presidencies and certainly under Ronald Reagan’s. The activist left in all of these countries is just itching to try its hand at violence and spectacle to match the demonstrations right here in the ‘ol U.S.A.
As president, Trump should travel where he’s invited and not worry about the reception once he gets there. The world “establishment” is worried about America’s perceived threat to turn off the spigot of resources, not that Trump will start a war. Any change has to scare them to death. Just like in this country, there’s a new philosopher in charge. It’s time the world got used to it. It’s a well-known fact that Donald Trump is a New England Patriots fan, and when the team won the Super Bowl last Sunday the president tweeted out his admiration of the team’s comeback shortly after the game ended. The message singled out quarterback Tom Brady, Coach Bill Belichick and owner Bob Kraft, all of whom were supposedly supporters of the Republican during last year’s campaign. Apparently the warm feelings aren’t mutual for at least three Patriots players. “Two other Patriots players — defensive back Devin McCourty and tight end Marcellus Bennett — announced their plans not to attend the traditional presidential celebration that follows a national championship. Hightower noted he also didn’t visit the Obama White House in 2014 after the team’s last Super Bowl win. So he gets a pass…mostly. Let me get this straight – the guy is purposely excluding himself from a national honor and he’s talking about inclusiveness? It’s just a different way of saying “Not my president,” the mantra of the brainless protesters across the country. I’d bet McCourty and Bennett are heroes in the eyes of Democrats now. Any affront to the president is a victory for them, right? Normally I wouldn’t make too much of athletes not going to the White House, but in these times of serious social strife the gesture means more than it normally would, especially for a new president. These guys are now going to attain the same status as national anthem protester Colin Kaepernick in most peoples’ eyes. What a couple of losers. Liberals keep saying they feel “excluded” from government despite Trump’s overtures to “all Americans”…stated numerous times. Any “exclusion” is a figment of their collective imaginations. I’m not aware of any conservatives boycotting Obama’s gesture during his years in the White House, though I’m guessing there probably were a few. The team’s visit to the White House will be a festive occasion, I’m sure, but Hightower, McCourty and Bennett will likely get all the press for their stupid boycott. It’s a shame, isn’t it?